EWING, NJ—Claiming their latest product will revolutionize the way America does laundry, the manufacturer of OxiClean held a press conference Wednesday to introduce their new stain-removing fabric scissors. 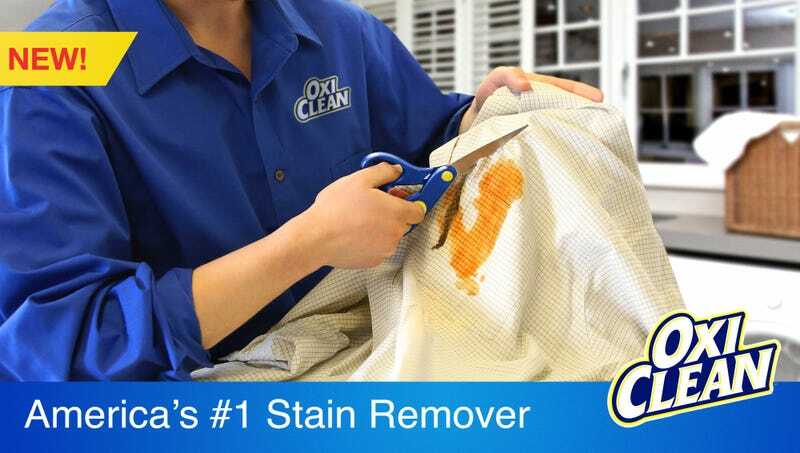 “Our OxiCut-brand shears offer a convenient, fast-acting, chemical-free way to get the stubbornest of stains out of your clothing,” said company spokesperson Alan Dewitt, adding that the new scissors can remove tough wine, dirt, and blood stains months after they have set in to clothes and can also “work wonders” on upholstery and carpet. “OxiCut is small enough to fit in your pocket or handbag, making it perfect for on-the-go cleanups before a big date or interview. And, you won’t have to scrub or pretreat the fabric before doing laundry. With just a few quick snips, every trace of those coffee or sweat stains is gone forever.” Dewitt added that OxiCut should be kept out of reach of children and recommended calling a doctor immediately if the product is ingested or gets in one’s eyes.